As a growth hacking digital marketer in the funded startup world, I regularly see the hustle-filled journey from startup inception to market-conquering results. If a genuine product market fit is established, the right marketing mix will generate fast-growth and long-term success. But it takes iterative testing and a methodological approach to achieve this sustainable return, and every recipe is specific to the individual business and its goals. This article will look at how influencer marketing may have a role within a startup’s marketing mix. Every industry in the world contains influencers. Whether for B2B or B2C, people have forged a path to influencer status within their niche. There are many different routes; consistent and reliable commentary on relevant topics, media appearances, and notable achievements in a specific field. Influencers are listened to and looked-up to. Simultaneously, they’re criticised, trolled, and called out on their opinions. Influencers are all in a position of authority within their community. People trust influencers, whom either have leverage among wide audiences (thousands or millions of people), or unique access to those in positions of power. In either case, startup founders and growth marketers would be foolish to ignore the potential impact of influencer marketing. Special Offers: A compelling offer which is backed by an influencer is a sure-fire tactic to get new customers through the door. For e Commerce, use a dedicated voucher code to measure the impact of influencer campaigns on conversions. Competitions: Select influencers to run and promote your competitions. Double down with sponsored advertising budget, which can be allocated to your influencers’ accounts for extra bite. You’ll need the right influencers, compelling prize giveaways, and budget to split between ads and influencer acquisition. Celebrities: This requires bigger (or more concentrated) budgets, but potentially has a higher immediate impact without the wait for incremental returns. Many celebrities are open to endorsements, but when the stakes are higher it’s all the more important to select the right influencer(s). Social Advertising: By using influencers in conversion-led social advertising (particularly visual ads), you’re hooking a user in with the familiar face. This barely departs from traditional advertising, which we all know is dominated by endorsements and celebrity cameos. An influencer may fulfil the same function within your startup’s niche, whether you operate in a B2B or B2C field. Overall, I advise that influencer marketing should usually be seen as a long game. Resonance among your audience will be achieved through an influencer’s long-term advocacy. For this, you need to offer additional value for the influencer (other than cash), and have a truly remarkable product or service. But the principles of influencer marketing can be applied as a hook for fast-growth startup tactics. User-generated: An influencer could take charge of your social channel for a day, or could be commissioned to create a batch of written or visual content on behalf of your brand. Curation: Influencers remain influential by getting exposure. Offer this as reward for influencer contributions to an article, video, or podcast. Boost the benefits by promising paid social advertising budget to maximise the content’s reach among the relevant audience. Create a win-win. Collaboration: Acquire influencers to be involved in content creation. They may have a better understanding about what will resonate, and thus your business will benefit from their involvement. For immediate impact, content must have immediate credibility. The involvement of industry influencers will enhance the credibility of your output, and ensure that content is more widely-shared in a short space of time. 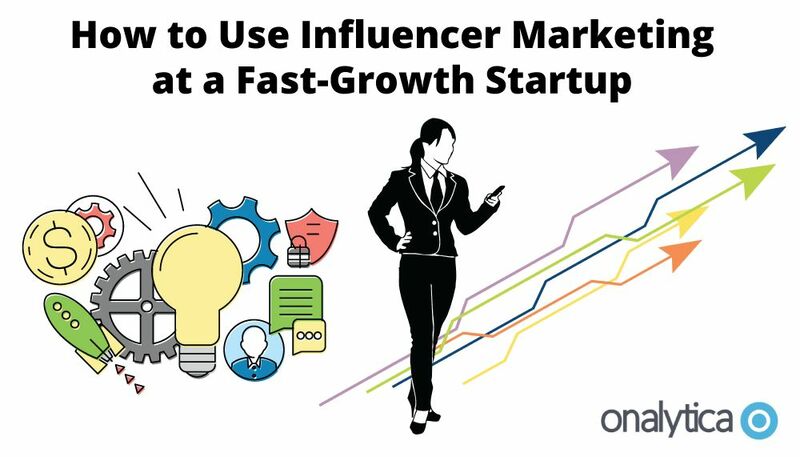 The process for startup influencer marketing success mirrors the end-to-end software functionality of Onalytica. Here’s how to make an impact. Discover & Identify: Firstly, you need to establish business goals and align your startup marketing strategy. Then, it’s time to identify the influencers in your field of interest. Consider their social following, receptiveness to brands, regularity of activity, and other factors when identifying who to monitor. Map: Organise and categorise the influencers that have been identified as leaders in your chosen communities. Create a shortlist, and understand the interconnected web of influence. Listen: This stage is essential in understanding what these influencers are talking about it, how they’re approaching topics, and in which ways you could approach them with the best chance of success. Engage: Ready, set, engage! It’s time to approach targeted influencers with a proposal, nurture the relationship, and get them set-up to work with your brand. This is most certainly not a catch-all approach. Each influencer will require an individual proposal, defined by your previous research. Remember that not all influencer marketing campaigns are founded on cash transactions. Measure: This is essential in the growth of any startup. Measure what works and what doesn’t. In-depth, iterative testing with tangible returns. This will help you refine the influencer marketing approach thereafter. Scale: Ramp things up in the areas that have most impact, and settle influencer marketing’s role within your wider digital marketing and PR mix. When people think of online influencers, they readily picture the typical Instagrammer generation. Muscles bulging amid a sea of selfies and carb-free meals, these are celebrities of a new digital age. Indeed, many earn a handsome income through product placements and promotions. It’s true that influencer marketing is most rife on Instagram. As the most creative platform, it’s been at the forefront of innovative visual marketing techniques. Influencer marketing and Instagram marketing are almost synonymous in this era, and both parties have benefited from its effectiveness. But influencer marketing is not confined to one or two channels. There are certainly influencers in your field spread across multiple digital channels; on social media platforms, blogs, and websites. For B2B industries, influencers are often writers, podcasters, or filmmakers. Leaders in their professional or academic field, and trusted for what they’ve achieved in their field. For B2C, there’s online community managers, YouTubers (who can earn millions), and bloggers. “Their fans trust that their endorsement of a product or brand comes from a well-researched, more holistic place, rather than something as simple as a signed contract. And while there is often a formal agreement in place between brands and influencers, influencers tend to be more selective about their affiliations, choosing to partner with brands that reflect their unique personal brands and won’t alienate their followers. It’s this integrity that resonates with a community. One area in which this is supremely evident is in the world of podcast sponsorship. Listen to any of the leading podcasts (Serial, Criminal, etc.) and the theme is for presenters to be genuine advocates of their sponsors. For long-term influencer marketing campaigns, integrity is essential. For the short-term product placement ads that are powered by concentrated big budgets, integrity is less important. There will be no product market fit unless there’s a community to which your startup can infiltrate from MVP onwards. Every successful business has an audience within a community, and that audience is influenced by people other than your business. Tapping into this sphere of influence will reap faster returns than plugging away in isolation. Influencer marketing is largely considered to be a long-term endeavour. Indeed, the benefits are cumulative and its impact is best measured over a sustained period. But this doesn’t mean that the practice is redundant for fast-growth startups. The principle of leveraging influencers and their community remains relevant, and can bring about mass awareness, overnight, at an early stage. It’s this awareness and credibility, in combination with a compelling product and optimised customer journeys, that will drive sustainable growth for a startup. Oren Greenberg is a digital marketing consultant and growth hacker based in London, where he helps funded startups succeed. He is the founder of Kurve, a startup-focused digital agency.